Can I purchase Software Assurance now and then upgrade to the next version for free? No, you can only purchase a Software Assurance contract during the first 30 days after a license purchase or while purchasing a regular update. Does my Support option include updates to the next (major) version? Only the Software Assurance contract includes free updates to major version updates. All other Support options include updates within the licensed version. How does licensing work in AgendaX? AgendaX licensing is based on the number of mailbox calendars that you display in the AgendaX Web interface. You can freely choose which mailboxes in your company you would like to display and which not. The total number of displayed mailboxes is the number of licenses you require. The AgendaX license is a onetime fee and includes patches and updates within the current version, as well as Standard e-mail support during the first 90 days. Additional Support options are available. Wie verhält sich AgendaX in einer Exchange cluster server Umgebung? Da sich AgendaX wie ein Outlook Client verhält, muss in einer Cluster Server Umgebung nichts speziell beachtet werden. Wenn ein Cluster Mitglied- Server ausfällt, verbindet sich AgendaX automatisch mit einem anderen Mitglied- Server, sobald dieser übernimmt. Wie einfach ist es, AgendaX zu konfigurieren? AgendaX bietet Ihnen eine webbasierte Konfigurations- Oberfläche, die eine einfache Einrichtung aller AgendaX-Funktionen ermöglicht. AgendaX Ansichten lassen sich leicht an die Corporate Identity und die Geschäftsanforderungen anpassen. Die mitgelieferten Symbole und -Farben, die zur Darstellung verschiedener Aktivitäten verwendet werden, können nach Belieben geändert werden. Globale Einstellungen sind Einstellungen, die alle Ansichten betreffen (z.B. Zeitformat, Sprache, etc.). Die Anzeigeeinstellungen beeinflussen die Anzeige der Ansichten (welche Farben zu verwenden sind, wie viele Tage angezeigt werden sollen usw.). Mit den Feature-Einstellungen können Sie verschiedene AgendaX-Funktionen aktivieren / deaktivieren. Mit den Ansichtseinstellungen können Sie festlegen, welche Ansichten verfügbar sind, und verschiedene Aspekte dieser Ansichten konfigurieren. Mit Kategorien können Sie festlegen, welche Outlook-Kategorien in den Übersichten farblich speziell gekennzeichnet werden. Zusätzliche Einstellungen ermöglicht es Ihnen, andere, nicht so gängige AgendaX-Einstellungen zu konfigurieren. Wie einfach ist es, AgendaX anzupassen? AgendaX wird mit einer Reihe von Symbolen ausgeliefert, die wichtige Funktionen darstellen, sowie Hintergrundfarben, Datumslayouts, Linealfarben usw. Es ist sehr einfach, Hintergrundfarben, Datumslayouts, Linealfarben usw. zu ändern, und bei Bedarf Ihr eigenes Logo und Hintergrundbilder hinzufügen. Sie können auch festlegen, wie Besprechungen angezeigt werden: Z.B. nur Wochentage anzeigen (ohne Samstag / Sonntag), nur Meetings innerhalb der festgelegten Arbeitsstunden anzeigen, Meetings ausblenden, die als frei gekennzeichnet sind, den Organisator und die Teilnehmer in einem Tooltip anzeigen, etc. Darüber hinaus können Sie dank Zugriff auf den Quellcode von allen Ansichten Ihre eigenen, benutzerdefinierten Ansichten programmieren oder von uns für Sie programmieren lassen. How are access permissions to calendars managed by AgendaX? AgendaX offers you 3 security levels: no security, minimal security, and full security. No security - Everyone sees all calendars, but by default AgendaX does not publish meeting details of meetings with the sensitivity 'Personal', 'Private' or 'Confidential'. Full Security - Users only see calendars of users who have granted them access rights to their Outlook calendar folder, with the option to display only Free/Busy data for calendars without permissions. You can also set up different installations of AgendaX to display separate groups of users if they are not allowed to view the data of the other groups. How can groups be managed in AgendaX? Calendar views showing different groups of people and/or resources can be created by the administrator or end users. The administrator can configure an unlimited number of individual groups consisting of Exchange distribution lists and individual users. The members of these groups are the users whose calendars are displayed by the AgendaX web application. Each AgendaX end user has the possibility to define up to 9 personal groups, which are only available to him / her. Personal groups are defined in the AgendaX web interface. Can AgendaX handle multiple time zones? Yes, AgendaX allows users to set the time zone they are in (this can change when employees move or travel between locations). This allows all free/busy times to be displayed in the respective time zone. Does AgendaX support multiple languages? Currently supported languages are English, German, French, Italian, Danish, Norwegian, Swedish, Dutch and Polish. AgendaX automatically adapts to the first browser language supported by AgendaX. Additional languages can be added easily. Upon request, we can send you a language file for translation, which we can integrate into the product within just a few days. We would like to hide meeting details for every user and only publish Free / Busy information with AgendaX. How can this be accomplished? We are moving to Office 365 (in one batch). What needs to be done to an existing installation of AgendaX V6? You will need to uninstall MAPI/CDO (Exchange Server MAPI) and install an Outlook 32bit client on the AgendaX server. Also, the AgendaX mailbox needs to be migrated to Office 365 first, before you start migrating user mailboxes. Log in on the AgendaX Server with the AgendaX user. This is VERY important because Outlook profiles are user specific. HKEY_CURRENT_USER\Software\Microsoft\Exchange or that its value is set to 0.
and add a value called AllowAutoDiscoverForNonOutlook and set its value to DWORD 1.
value called AllowAutoDiscoverForNonOutlook and set its value to DWORD 1. Then, create the Outlook profile and make sure that Exchange Cache mode is disabled in the Outlook profile. Enter the Outlook profile name (either in AgendaX Setup if you are setting up a new instance of AgendaX or in AgendaXCfg.exe (under MSX Version / Outlook MAPI Client / Outlook Profile Name), if AgendaX is already installed. The Standard- Name for the first Outlook- Profile that is configured is ‘Outlook’. Start Outlook with that profile and make sure that the profile works. When you are prompted for a password, make sure to check the ‘Remember password’ checkbox. Please give the AgendaX user Reviewer rights on the top of the mailbox and the Inbox, and Editor rights on the Calendar folders. $InboxName = "$($Mailbox.PrimarySMTPAddress)" + ":\" + "$($InboxStat.Name)"
$CalendarName = "$($Mailbox.PrimarySMTPAddress)" + ":\" + "$($CalendarStat.Name)"
Write-Host "Applying permissions to mailbox: $($Mailbox.Name) (TOIS/$($InboxStat.Name)/$($CalendarStat.Name))"
We are moving to Office 365 (gradually). What needs to be done to an existing installation of AgendaX V6? If the move to Office 365 takes some time and you migrate mailboxes with several batches, we suggest to install a second instance of AgendaX during the transition. The first (existing) instance will read on-premise mailboxes and the second (new) instance will read migrated (O365) mailboxes. During the transition, you will still see all calendars of both on-premise and migrated mailboxes in the AgendaX web application. Install the second service with the Multi service configuration tool AgendaX multi service configuration utility. The service account you enter will be the account used to run the AgendaX Update Service. This should ideally be the new AgendaX user on Office 365. If this is not possible, select a local user with Administrative privileges on the AgendaX Server. Run the AgendaX Configuration in the AgendaX O365 installation (AgendaXCfg.exe), click MSX Version, select Office 365 and enter the name of the Outlook profile you created, logged-in with the O365 AgendaX user (or the local user). Run the AgendaX Configuration of both the old and the new installation (AgendaXCfg.exe) and tick the “Multiple services write to this database” option and drop the database tables (only once) under Config / Drop tables. Check the Windows Application Eventlog for possible warnings / errors. Each of the services will add warnings to the Application Event log for the mailboxes that are not on their system. This is normal. The on-premise Setup will create warnings for the O365 mailboxes and the O365 Setup will create warnings for the on-premise mailboxes. If you get warnings on the O365 installation about mailboxes that cannot be found in the global address book and these mailboxes have already been migrated to O365, you will have to re-select them from the address book in the AgendaX group definitions (AgendaXCfg.exe / Groups). After both AgendaX Update Services have finished scanning through the mailboxes, you will see both on-premise and O365 mailbox calendars in the AgendaX web application. While you are moving users from the on-premise Exchange servers to O365, you will need to re-run the above Powershell script to set permissions on the newly moved mailboxes. Run Internet Information Services (IIS) Manager, navigate to Sites / Default Web Site / AgendaX, click “Basic settings” and change the location of the “Physical path” to the folder of your new AgendaX O365 installation. If you have made any configuration changes on the AgendaX Administration page (in the AgendaX web application) since you installed the O365 installation of AgendaX, or if you have made changes to the collapsible group menu in the multmenu.txt file, copy config.inc and multmenu.txt (both are located in the AGENDA subfolder of your AgendaX installation folder) from the old Setup to the O365 setup. The final step is to tell the AgendaX Update service that no longer other services are using the same database. Run the AgendaX Configuration (AgendaXCfg.exe) in your new O365 setup folder and untick the “Multiple services write to this database” option and drop the database tables under Config / Drop tables, then click “Update” and “Yes” to restart the service. Can I add Exchange distribution lists to AgendaX groups instead of individual mailboxes? Yes. AgendaX groups can contain individual mailboxes and / or Exchange Distribution Lists. Exchange Distribution Lists are resolved to their members each time the AgendaX Update Service scans calendars, so new members of an Exchange Distribution List are automatically added to AgendaX groups. Likewise, members that are deleted from an Exchange distribution list also get deleted from AgendaX groups. Therefore, you only need to update group membership in Exchange distribution lists, and AgendaX automatically updates its groups. Permissions that need to be set for the AgendaX account on Exchange Server 2013, 2016, and Office 365 are Outlook folder level permissions. Since folder names in Outlook differ depending on the language used when the mailbox is first opened with Outlook, you'd have to know which employee uses which language to assign permissions to the correct folders. In addition to that, you'd have to know what the folders are called in these languages. If you have mailboxes in multiple languages in your company, you can easily set the required permissions for the AgendaX account using the following script, which works for all languages. Just copy and paste the above script into Powershell. It will assign Reviewer rights on the top of the mailbox and Inbox, as well as Editor rights on the Calendar folder. If you don't want to assign these rights on every mailbox in your organization, but would rather limit this to an organizational unit for example, you can modify the Get-Mailbox statement on the 1st line by adding -OrganizationalUnit with the name of the organizational unit you wish to assign permissions in. The supplied License Key is not working. The entered key is replaced with “30 day Trial Version”. Please make sure that you enter the Company name exactly as provided on the license document or in the email you received from us (capitalization, spacing, etc.). Disable 'Show friendly HTTP errors' in Internet Explorer / Tools / Internet Options / Advanced / Browsing. On IIS, in the virtual directory of AgendaX, under Error pages, 500, Edit feature settings, set the Error responses option to 'Detailed errors'. This always displays detailed errors instead of an HTTP 500 error, which is useful for detecting problems. Most probably Exchange Cache Mode is turned on in the Outlook profile of the AgendaX account. Log in with the AgendaX user on the AgendaX server. Edit the Outlook profile that is configured for the AgendaX service (AgendaXCfg.exe / MSX Version) and make sure that Exchange Cache mode is turned OFF. One of the AgendaX groups contains no members, or contains an empty distribution list. Check that all of the AgendaX groups contain members and / or non-empty distribution lists. Reported Errors in Application Event log of AgendaX Update Service: Event ID 139: Error creating profile. MAPIAdminProfiles returned 80040605 Event ID 137: AgendaX Debug Log. \ Location: Create TempProfile failed. \ Data 1: %3\ Data 2: %4 Event ID 123: Mailboxes Scanned 0. Mailboxes on other sites (not scanned locally): 0. Check that the AgendaX user has sufficient rights on the AgendaX server. In case you are using Exchange Server MAPI (not Outlook MAPI), the AgendaX Update Service dynamically creates MAPI profiles to access mailboxes on Exchange Server. These profiles are stored in the registry. Please make sure that this account has administrative privileges on the AgendaX server. Also check that you have the latest MAPI version installed. MAPI can be downloaded from: http://www.microsoft.com/download/en/details.aspx?id=1004 Check the LogonServer and LogonMailbox parameters in the AgentX.ini file in your AgendaX installation directory. They should point to a valid mailbox (the mailbox associated with the AgendaX account). AgendaX läuft als serverbasierter Windows-Dienst, der in regelmäßigen Abständen Termine ausgewählter Benutzer aus den Microsoft Exchange Server Message Stores / Datenbanken liest und die Informationen in eine zentrale Datenbank (SQL Server, SQL Server Express) schreibt. Die Kalenderinformationen werden dann vom Microsoft Internet Information Server (IIS) auf der Intranet- oder Internet / DMZ-Seite des Unternehmens veröffentlicht. AgendaX verwendet dazu Active Server Pages, auf die über einen Webbrowser zugegriffen wird. Was sind die System- Voraussetzungen für AgendaX? Obwohl AgendaX auf dem gleichen Server wie Exchange installiert werden kann, empfehlen wir Ihnen, es auf einem bestehenden Microsoft IIS-Server mit mindestens 2 GB RAM und einer Dual-Core-CPU zu installieren. Can meetings be booked in AgendaX? Yes, if configured, all or selected users can make bookings via AgendaX without having to return to the Outlook calendar. Standard booking templates can be created as needed, pre-filled with start/end times, topics, categories, all-day events, etc., making it quicker and easier for the end user to complete his or her booking. If configured as an option, all or selected users can also change existing meetings. enable selected employees to book meetings on behalf of others (delegate), e.g. to show to others that a person is off sick. All bookings are automatically synchronized with the Outlook calendar. A log of all bookings recorded via AgendaX is kept. Can I use AgendaX to show calendars of multiple Exchange Organizations? Yes, there are several ways to connect different AgendaX sites that do not share the same Active Directory Forest or domain, or are even in completely separate companies. For example, AgendaX can scan the mailbox calendars on local Exchange servers and write the information to a local or remote database. A data source is configured between all locations (a specific port can be freely selected) so that all AgendaX installations know each other and write to a central database. How is AgendaX different from Outlook Calendar? Outlook calendar can be slow because information is read from the Exchange server in real time. With Outlook Calendar, it is impossible for a receptionist to see at a glance where a person is. AgendaX can be used across untrusted domains and even across organizations. With AgendaX you can easily filter views by categories (e.g. to create holiday calendars). AgendaX can be made accessible through the Internet, e.g. when an employee is on site with a customer and needs to quickly check the availability of his colleagues in order to arrange a follow-up meeting with the customer. With AgendaX you can create reports on calendar activities (e.g. workload, time spent on a customer, annual leave, sick leave, etc.). AgendaX can include Active Directory information and thus be used as a company directory. How can I see AgendaX in action? download a free trial version and install it on your own web site. Can I install AgendaX on multiple servers? Is there a server license I need to purchase for each additional server? Yes, you can install AgendaX on multiple servers, as long as the total number of different published mailbox calendars on all installations is not higher than the total number of licenses purchased. There are no additional costs associated with installing AgendaX on multiple servers. What is the pricing breakdown? Also, can I set this up but only publish the calendars of a group of users? Pricing is calculated based on the number of mailbox calendars you want to publish. The minimum number of licenses is 10, and you can get any number of licenses from there. You can select the calendars you wish to read / publish; you don’t need to license the whole global address list. In AgendaX you create groups (e.g. Sales, Marketing, etc. or Location 1, Location 2, etc.) and for each group you select members from the GAL (distribution lists or individual mailboxes). A mailbox can be part of multiple groups and is only calculated as one license. The total number of all members of these groups determines the number of licenses you need. The number of AgendaX web application users is irrelevant. Only the total number of published mailbox calendars determines the licenses needed. Is V5.1 of AgendaX compatible with Exchange Online / Office 365 / Exchange 2013 / Exchange 2016? No, you will need to upgrade to V6 of AgendaX, as V5.1 is not compatible with the above Exchange Server versions. You can get a quote for the Upgrade from our Sales team. Please fill out the inquiry form on our homepage and a member of our Sales team will get in touch with you asap. Does AgendaX support hybrid deployments of Office 365 with on-premise and cloud servers? Yes, V6 of AgendaX supports hybrid deployments of Office 365. In this case, we recommend that you install two AgendaX services that write their data to the same database. One service reads the local calendars, the other the calendars in the cloud. This ensures that local calendars and calendars in the cloud can be easily read and that they appear together in the AgendaX overviews. Does AgendaX support hosted Exchange environments / Exchange Online / Office 365? Yes. AgendaX supports all hosted Exchange environments. Does AgendaX support Public folder calendars? No. AgendaX supports only mailbox calendars, not public folder calendars. Public folders are deprecated and will not be available in the next Exchange Server version. We therefore recommend converting Public Folder Calendars to Mailbox Calendars. Allows meetings to be scheduled via the web interface without Outlook, with the option to restrict bookings to free time only, make location a required field, etc. AgendaX reporting can also be used by business and HR managers within your organization to report on activities, chargeable days, sick days etc. You can chose which mailbox calendars are shown with AgendaX. Test mailboxes or administrative mailboxes (e.g. Administrator) do not count as licenses and are therefore not charged. Licenses can be added to the base license at any time and for any number of mailboxes (minimum 10). No need to buy packages of 50 if you really just need 12 additional licenses. The increased visibility and usability AgendaX gives to the contents of the Outlook calendars will encourage more active and accurate use of this facility. These are just a few of the many points which make AgendaX one of the best-selling group calendaring solutions available today on the market. The AgendaX Update Service has a negligible impact on the Exchange Servers. When it scans the Exchange mailbox calendars, it does so by scanning each configured mailbox individually one at a time. You can therefore compare the bandwidth and processor usage of the AgendaX Update Service with a (very fast working) user that opens each mailbox one at a time and reads every calendar entry that takes place in the interval specified by the Administrator (days past, days ahead switches in AgendaXCfg.exe). Scanning a calendar takes anywhere between a few milliseconds to a few seconds, depending mostly on the speed of the Exchange Servers and network throughput between the AgendaX Server and the Exchange Servers. The above applies to a single AgendaX Update Service configured to scan all the mailboxes into 1 database. You can also install several AgendaX Update Services working in parallel on a single machine, each scanning different mailboxes either into the same database (to cut down time) or into several databases (to handle access permissions or visibility requirements, e.g. maybe some groups should not see other groups’ calendars). Can I scan calendars of multiple Exchange server versions? Muss ich AgendaX direkt auf dem Exchange Server installieren? Nein, AgendaX kann auf jedem IIS Server installiert werden. Eine Installation auf Exchange Server ist nicht erforderlich. Auch müssen auf dem Exchange Server keine Komponenten installiert werden. More information on how to setup a virtual directory can be found in the Administrator Guide. I would like to install the AgendaX Update Service (that reads calendars from Exchange) and the AgendaX web application on 2 different servers. Is this possible? Yes, perform a full Setup on the server that will host the AgendaX Update Service, Then, copy the Inetpub/AgendaX folder to the server that will host the AgendaX web application, set up the virtual directory, and register AEPwDC.DLL with regsvr32. This DLL is required to decrypt the SQL password. Also, you have to create a datasource (preferably with the same name) on the web server, pointing to the SQL server database. If you name it differently, you will have to also change it in AgendaXCfg.exe under ‘Config’ and ‘Servers’. Please note that you have to create a system datasource (not user datasource), to be accessible by all users. Please note that when you make changes to the AgendaX Configuration using AgendaXCfg.exe, you have to copy the file AgendaX.inc to the AgendaX installation directory on the web server to reflect those changes to the web application. Does AgendaX support Windows Authentication on the AgendaX database? Yes, but we recommend using SQL authentication, as it's easier to manage. If your company policies don't allow usage of SQL authentication, you can use Windows authentication, but you will need to grant all AgendaX web application users permissions on the SQL database. When using Windows authentication, do not enter a SQL username and password during Setup or in AgendaXCfg.exe / DB User and Servers / DB Username. Create a user account ('AgendaX') in your local Active Directory and log in with that account on the AgendaX server. Start Outlook and create a profile that accesses the mailbox of the AgendaX user. Finally, install AgendaX and when prompted for the Exchange Server version, check the checkbox labeled 'Exchange is hosted by a hosting provider in an untrusted domain' and enter the name of the profile you created above. 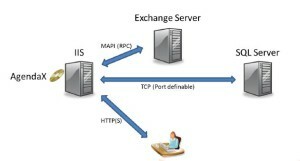 AgendaX uses MAPI or Outlook MAPI to connect to the Exchange Servers. MAPI is a standard Microsoft protocol that uses RPC or HTTP connections to / from the Exchange Servers. When using Outlook MAPI, the RPC / MAPI packets may be encapsulated in HTTP packets. AgendaX uses standard TCP/IP connections to access SQL servers / SQL Server Express. What is the latest patch available for V5? Development of V5 has ceased. The latest patch available for this version is patch 38. You can download this patch, or the V5 setup that includes this patch (in case you need to install it on another server) from our homepage in the Downloads section. What is the latest patch available for V6? Please note that the current trial version download already includes the latest patch.